Back in late 2000, early 2001, my marriage was falling apart. We’d gotten married in 1999, but it wasn’t much of a marriage. Something I’ve written about before and something I’m not going to get into right now. 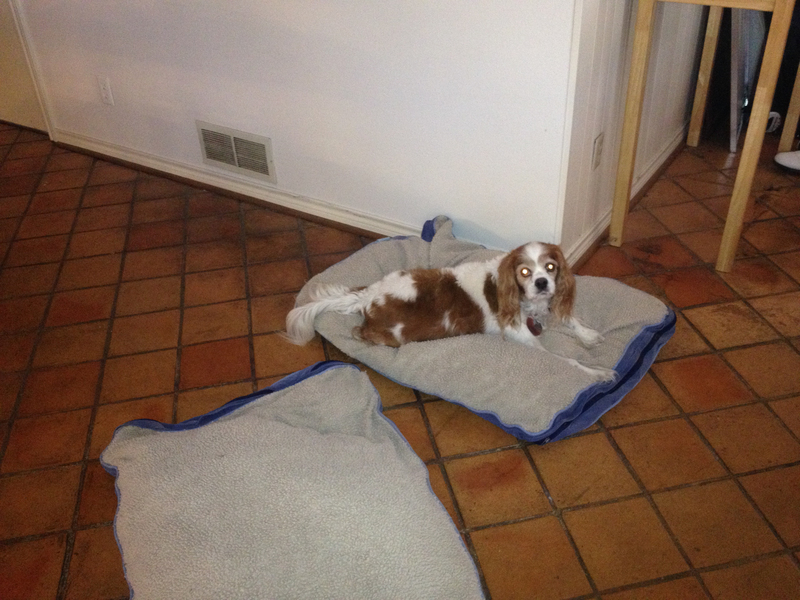 Because of Mom and Dad – who had several King Charles Cavalier Spaniels – my wife decided she had to have a Cavalier. We found a breeder through Mom and we adopted a puppy: Barrister. He was a good little pup, but we felt bad about him spending his days at home alone. In the middle of the downward spiral of our marriage, my wife convinced me we should get Barrister a friend. The only reason why I agreed was to make her happy. Or, at least, try to make her happy. Things in our household were anything but happy, but if I could do something to appease her, I did. 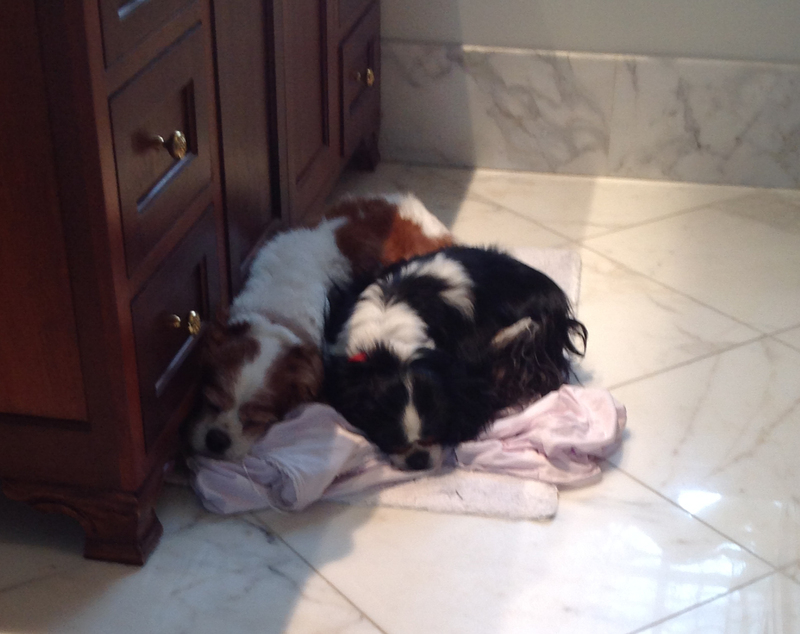 We found a Cavalier rescue group and drove almost to 2 hours to some woman’s house – fighting almost all the way. When we finally got there, in and among this group of puppies, we found one special boy. The product of a puppy mill in Missouri, he spent the early weeks of his life in a kennel with a least a dozen other puppies – less than ideal. But this, however, lead to one of his better traits. This rescue group saved a dozen or so puppies on Saint Patrick’s Day, so they all had Irish names. I’m not sure if we picked him or he picked us, but they named him Seamus. We brought him home and immediately he took to me and I to him. Our first puppy, Barrister, was “hers”, so I made Seamus mine and he made me his. During our divorce, as we were splitting up our belongings, it was only natural that I would take Seamus with me. And I was glad to do so. After the divorce, I had to move in with Mom and Dad. 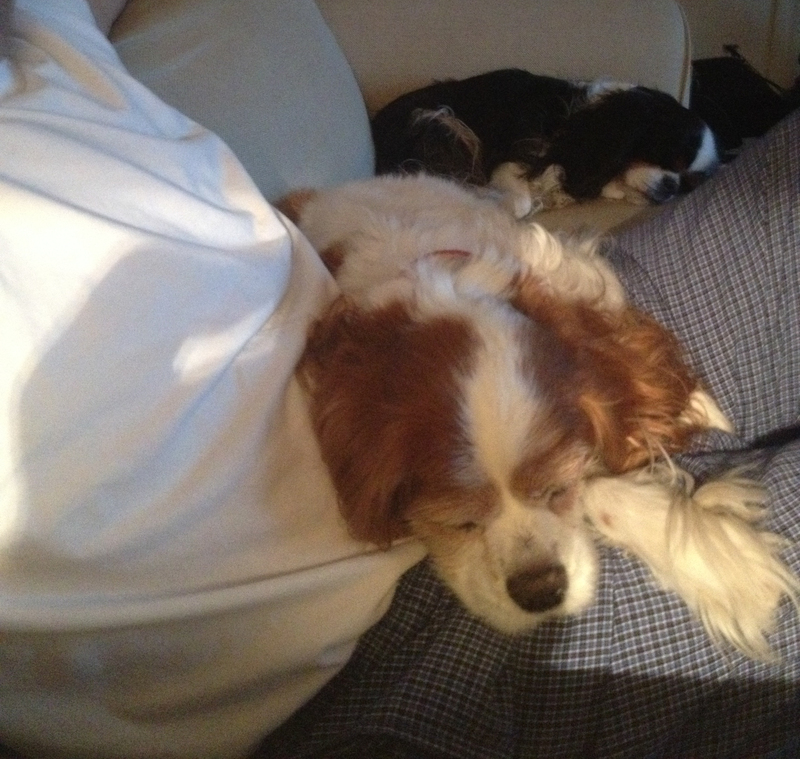 Seamus took the move well and made quick friends with Jack and Chelsea – the other dogs in the household. But more importantly, he made friends with Mom and Dad. Again, because of his puppy mill upbringing – where he was forced into a cramped environment with a dozen or more other puppies – he craved touch. Being next-to or on-top-of someone was what he wanted and needed. When you sat down, he was almost immediately in your lap. He slept with me, he followed me. If you sat down, he was in your lap immediately. More often than not, I would wake up in the middle of the night, pinned against the wall with him right next to me in bed. When I moved back to Arkansas to finish school, I couldn’t take Seamus with me. I had to leave him with Mom and Dad. This wasn’t a big deal for him, for he had, in turn, adopted Mom and Dad as his parents. But, when I came home, he knew “daddy” was home. I was gone for 6 months and then lived with Mom and Dad for another year afterwards before I could afford to move out. 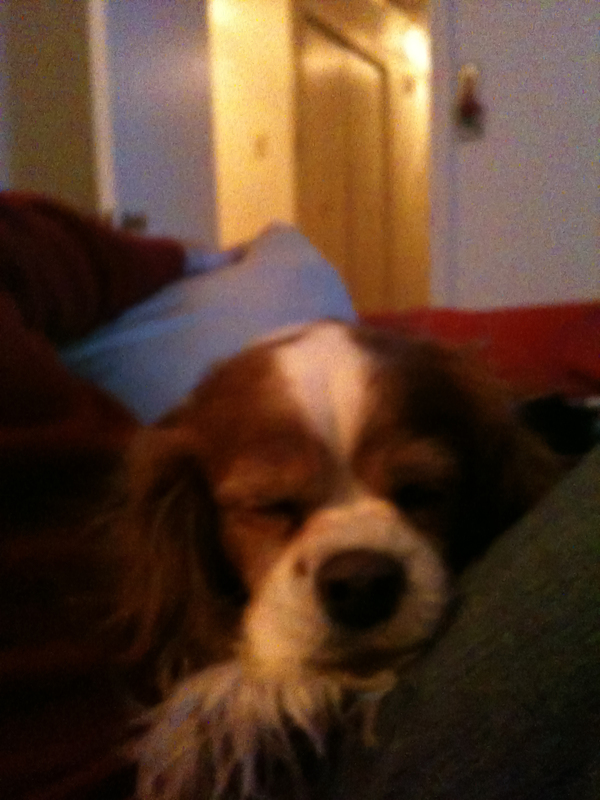 Once I did, it wasn’t an easy decision for me to leave Seamus with Mom and Dad, but he loved them, and they loved him. It worked on many levels. But still, when I came over, he knew me and paid me close attention. Over the past decade, I’d come and go from Mom and Dad’s house, but Seamus was always there. As he grew older, he’d nap more, but whenever I came over, he was always the first I went to. I’d wake him and he’d wag his tail; he knew I was there to see him. I’d plop down on the couch, and he was close behind me, scratching at the couch, asking for help up, just so he could sit in my lap. I cherished those moments with him. I will miss those times. I am sad and I miss my “son”. He was a reluctant addition to my life because of someone else. But he was with me through the hard times and through the good. He loved me and I loved him. He wanted nothing more than to love someone – that and treats. That dog loved treats. Whether Cheerios or dog biscuits or cheese or french fries or Cheetos – he could eat. You had to be careful when giving him something. More often than not, giving him a treat resulted in you pulling back a nub as he’d nearly bite off half of a finger. But he could love even more. He was a loving boy. Through my sadness, I remember an email that was sent to me however many years back. True story or not, there’s no better way to describe Seamus. Being a veterinarian, I had been called to examine a ten-year-old Irish wolfhound named Belker. The dog’s owners, Ron, his wife, Lisa, and their little boy, Shane, were all very attached to Belker, and they were hoping for a miracle. I wish Seamus could have stayed longer. He was rescued on Saint Patrick’s Day and he went to sleep in my arms on Saint Patrick’s Day. I can’t think of a better way to complete the circle. Robert- I am so sorry to hear of the loss of precious Seamus. It was tough to read about how you two found each other and needed each other at just the right time. It was meant to be. He showed you unconditional love and you returned it. You are a better person for having given Seamus a true home. May you smile often when thinking of him. May he rest in peace.